Acupuncture is many things. There’s the traditional insertion of needles at acupoints on the body. But there’s also electro-acupuncture, acupressure, ear acupuncture, hand acupuncture, foot acupuncture, scalp acupuncture, insertion of gold beads, electrodermal acupuncture with a biofeedback machine, moxibustion with burning mugwort, cupping, and even tongue acupuncture. 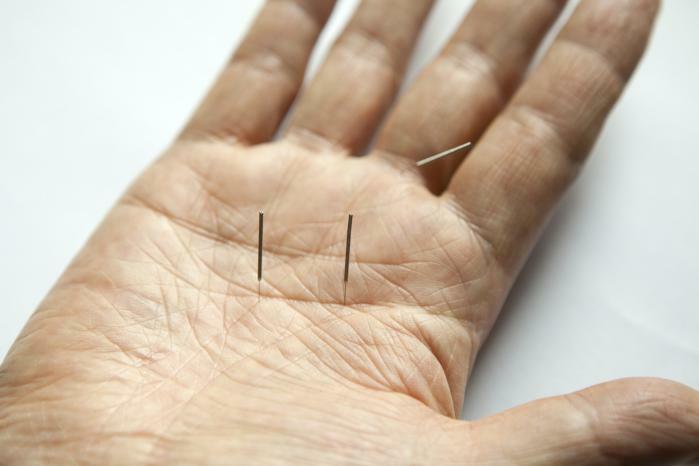 In other variants of acupuncture, homeopathic remedies are injected at acupoints, and acupoints are stimulated with light, sound, pressure, heat, electromagnetic frequencies, and waving the hands over acupoints. The silliest is tong ren, where patients rhythmically tap acupuncture meridians on an acupuncture doll. A close second for silliness is esogetic colorpuncture. Colorpuncture applies various colors of light to acupoints with a small flashlight-like instrument with a colored quartz rod. The tip of the instrument touches the skin or is held a short distance above it. Seven basic colors are used: the warm colors (red, orange, and yellow) increase energy; the cool colors (green, turquoise, blue, and violet) decrease energy. Using warm and cool colors together will balance yin and yang energy flows. Treatments last 10 to 90 minutes. Colorpuncturists diagnose by Kirlian Energy Emission Analysis. Kirlian photography captures the phenomenon of electrical coronal discharges. Some claim it depicts the aura or energy field of living organisms, but the same coronal discharges are seen with inanimate objects. Who wouldn’t want access to soul information? Of course, there is no supporting research. Colorpuncture is mere fantasy. The many testimonials from patients only demonstrate that it elicits a placebo response. So does traditional acupuncture, which has been called a theatrical placebo. The nonsense about colorpuncture can be entertaining, but reality can be more interesting than fantasy; truth is often stranger than fiction. Color is not useful for treatment, but it can be very useful for diagnosis. There are a variety of unusual colorations that are useful signs to help doctors figure out what’s wrong with patients. They were featured in a recent report in FP Essentials, a continuing medical education product of the American Academy of Family Physicians. There were several I had not heard of. In chlorosis or green sickness, the skin has a pale green tinge. It was originally classified as a hysterical condition but was later linked to severe iron deficiency anemia. This disappearing disease frequently afflicted young women in the nineteenth century but it seems to have vanished completely by the early twentieth century, perhaps because of better diagnosis and treatment of anemia. The reason for the green color remains a mystery. The Blue Fugates were a family in the hills of Kentucky that carried a recessive gene for methemoglobinemia. They were descendants of a French orphan, Martin Fugate, who settled near Hazard, Kentucky, in 1820. Their blue skin color could be reduced by treatment with methylene blue. As their descendants moved out of the area, the recessive gene pool was diluted; the last known Blue Fugate was born in 1975. Acquired methemoglobinemia can be caused by various chemicals including sulfa drugs, aniline dyes, nitrates in drinking water (from fertilizers leaking into wells), and certain anesthetics like benzocaine. Normal hemoglobin incorporates ferrous iron (Fe2+); methemoglobin incorporates ferric iron (Fe3+), which is less able to bind to oxygen and delivers less oxygen to tissues. Treatment is IV methylene blue, which restores the iron to the normal ferrous state. Blue baby syndrome can be due to methemoglobinemia (babies are particularly susceptible) or to congenital heart disease, most commonly tetralogy of Fallot, which requires surgical correction. In osteogenesis imperfecta, the white part of the eye has a blue appearance. The sclera is thinner than normal because of a collagen defect. This genetic disorder causes brittle bones that fracture very easily, often without apparent cause. Parents of these children have been wrongly accused of child abuse. Red man syndrome is a reaction to IV infusion of vancomycin and some other antibiotics. The symptoms, due to histamine release, include a red upper body rash, itching, dizziness, generalized discomfort, headache, fever, chills, and paresthesia around the mouth. Gray baby syndrome is caused by a buildup of the antibiotic chloramphenicol, which is not well metabolized in infants. The gray appearance is due to low blood pressure and cardiovascular collapse. It can be fatal. Chloramphenicol is rarely used in the United States but can be bought over the counter in Mexico. Bronze baby syndrome is a dark gray-brown pigmentation of the skin, mucous membranes, and urine of a jaundiced infant undergoing phototherapy. Bronze diabetes is another name for hemochromatosis, an iron-overload condition that can be hereditary or due to multiple blood transfusions. Patients look like they have a deep suntan. Iron accumulation in the pancreas can cause diabetes. Yellow fever is a viral disease transmitted by mosquitos. In severe cases, patients become jaundiced, hence the name yellow fever. Carotenosis or carotenemia is a yellowing of the skin that can be differentiated from jaundice because the whites of the eyes are not affected. It is usually caused by an excessive intake of foods that are high in carotene. I once had a very yellow patient who had been trying to lose weight by eating LOTS of carrots; she was a light-skinned redhead and her colorful appearance was really striking. Jaundice refers to a yellowish or greenish discoloration of the skin due to high levels of bilirubin in the blood. It is caused by various diseases including liver diseases and hemolysis of red blood cells. The yellow color first appears in the whites of the eyes. Neonatal jaundice is seen in over half of newborn babies and usually resolves in a few days. Severe cases require treatment with light exposure to prevent kernicterus and brain damage. The ancient Greeks believed that jaundice could be cured by looking at a yellow bird. In carbon monoxide poisoning, a cherry red discoloration of the lips and cheeks is seen at autopsy but rarely seen in living patients. 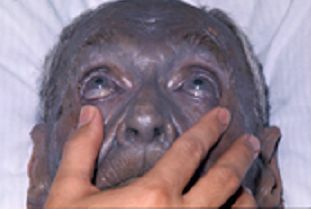 Argyria is an irreversible blue-grey discoloration of the skin caused by consumption of silver. Colloidal silver is an alternative medicine treatment that has been used for a variety of conditions including Ebola. It is not effective for anything and it makes chronic users look like smurfs. I wrote about it in a SkepDoc column. Chrysiasis is a greyish skin discoloration due to excessive consumption of gold. Like argyria, it is irreversible. Gold is an effective disease-modifying treatment for rheumatoid arthritis but has been replaced by newer treatments. Gold supplements are used in alternative medicine to enhance creativity, boost energy and mood, enhance eye-hand coordination, improve memory, aid in relaxation, treat depression, reduce tumors, fight arthritis, and improve overall health. There is no evidence that they can do any of those things. Albinism is the congenital absence of any pigmentation, caused by inheritance of recessive genes from both parents. These individuals have white skin, white hair, and pink or red eyes. They may have poor vision or other eye conditions, and they are at increased risk of skin cancer. Albinos have been persecuted, killed, and dismembered due to superstitious beliefs in some parts of Africa. In Vitiligo, patches of skin lose their pigment. The cause is unknown and there is no cure. It can be very disfiguring and can have emotional and social consequences. One thing FP Essentials omitted was Addison’s disease, an endocrine disorder where the adrenal glands don’t produce enough cortisol. It can cause hyperpigmentation and darkening of the skin. Acupoints are imaginary. Acupuncture is a theatrical placebo, and it is not surprising that adding colors to the performance contributes to the theatricality. Colorpuncture is fantasy. Skin coloration as a diagnostic sign is reality. I personally prefer reality.